You will be delighted by freshly prepared ski-runs and the unique landscape. We offer great runs, many different pastures and huts, beautiful views over the Olympic area of Seefeld and the Inntal Valley, and plenty of sun and snow. 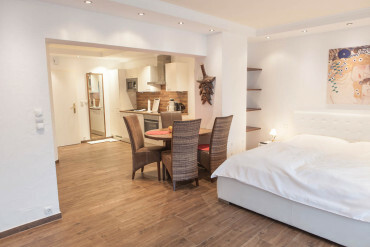 The wide range of Gschwandtkopf lifts is complemented by many different offers in the region to make your stay perfect. As a guest in our apartment building at the foot of the Gschwandtkopf, you neither need a ski bus or a car to go skiing. A stay at the Happy Gschwandtkopf Lift could not be easier. 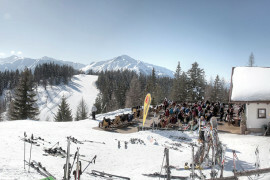 Find out about the current prices for ski passes, season tickets, Tyrol Snow Cards, Happy Ski Cards or Seefeld Cards. Our apartment building is located right below Happy Gschwandtkopf Lifts. Besides combining accommodation and skiing offers, we also offer ski rental and a ski school located right in the building. The breathtaking view over the Inn Valley is truly inspiring. The Sonnenalm offers delicious traditional food, cozy deck chairs and long hours of sunshine at the summit of the Gschwandtkopf. It is an absolute must-have during each stay at Seefeld. The Sonnenalm team looks forward to your visit. 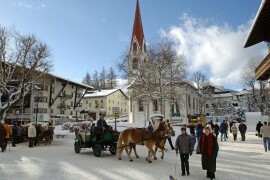 Unique natural experience, clear mountain air and the hospitable people of Seefeld extend a very hearty welcome. You will not miss anything in Seefeld with numerous events, shopping opportunities, various sporting activities and culinary highlights. We advise you to find what is right for your needs out of the abundance of offers. Seefeld offers optimal conditions for every country skiing enthusiast, either beginner or professional. It has the most modern biathlon complex in Europe, right at the Gschwandtkopf, and almost 300 kilometers of perfectly prepared ski trails. So, you will need a lot of time to find better conditions for your long-term stay. 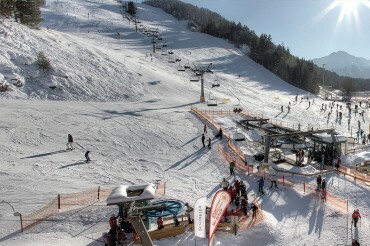 Gschwandtkopf also offers the perfect opportunity for children and beginners to enjoy the skiing fun. Besides the more challenging ski-runs, you will also find here easy runs and lifts for children. We are happy to recommend local ski rental "Skimeier" and the ski school "Sport Aktiv", where you can select and book the optimal equipment and matching ski lessons for you and your children.